THE UNION JACK ON THE RUDDER and under the wings was the first national identification mark adopted by Great Britain for military aircraft. The necessity for distinctive markings arose soon after the outbreak of hostilities in 1914. 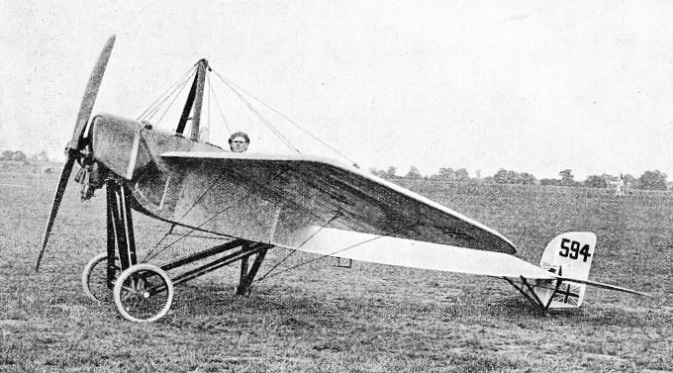 This picture of a Morane monoplane shows the method in force in 1915. Under the wings there is in addition a “target” - concentric rings of red, white and blue. THE need for some system by which the nationality of an aircraft could readily be determined by observers on the ground and in the air first became apparent soon after the outbreak of the war of 1914-18. In those early days, British military aircraft carried no markings to indicate their nationality, and during the first two months of the war R.F.C. pilots were occasionally subjected to rifle fire from their own troops, who mistook them for enemy machines engaged in reconnaissance duties. There were even rumours that several unsuspecting British pilots had narrowly escaped falling victims to the misplaced zeal of French aviators unfamiliar with the aircraft of their British allies. as its distinguishing mark a blue spot surrounded by white and red circles; German aircraft had begun to experiment with a large black Maltese Cross. The French marking was distinctive and easily recognizable; but, before the Union Jack had been in use for many weeks, it was discovered that, when seen at a height, the red St. George’s Cross in the Jack was so prominent as to be easily confused with the German Maltese Cross. “All aeroplanes of the R.F.C. are to be marked on the underside of the wings and on the rudder with concentric circles similar to those on French machines but with the colours reversed, that is, with a red circle inside a blue ring. The circles will be as large as possible. In addition, a Union Jack, 2 ft by 1½ ft, will be painted on the wing-tips outside the circles.” The Union Jack was soon dispensed with as a war-time marking and, instead, instructions were issued on May 16, 1915, for red, white and blue stripes to be painted on the rudders of all British aircraft - in place of the concentric circles previously specified - with the blue stripe next to the fin and the red stripe outermost. The object of this innovation, which was already in use by the French, was largely to facilitate recognition between machines in the air and the idea was quickly adopted by the German Air Force, which used a Maltese Cross on the rudders of German aircraft. This form of rudder marking on British military aircraft survived until 1932, when, to differentiate between French and British practice, the colour order was reversed and the red stripe brought next to the fin. Today, R.A.F. aircraft no longer carry rudder markings; by 1934 the advance in aircraft performance had been so great that the imposition of large quantities of paint on the sensitive control surfaces of a high-speed aeroplane was considered to be undesirable and the practice was therefore dropped. The addition of the concentric rings, or “targets”, to the fuselage sides of British military aircraft was made under an order from R.F.C. Headquarters on June 23, 1915. The object was to enable pilots to distinguish friendly from hostile machines at the greatest possible distance. The same idea underlay the later order to supplement the existing “targets” on the underside of the lower wing with similar markings on the upper surface of the top wing. The problem of establishing an aeroplane’s nationality had no sooner been satisfactorily solved, however, than the rapid increase in the numbers of aircraft at the front and the development of air fighting made it important to be able to identify individual machines or, at least, machines belonging to the same squadron. Artillery forces, for example, needed to be able to recognize the aircraft of Corps squadrons which were directing their “shoots”, and in air combats it was essential that a flight commander or squadron leader should quickly be able to identify any particular machine in his formation. The first official squadron markings used by British military aircraft were those allotted to twelve BE2c squadrons in April 1916. These markings were carried on the tops, bottoms and sides of the aircraft fuselages. Soon individual markings appeared in addition to the squadron markings. The R.F.C. and R.N.A.S. pilots never carried their artistic inclinations to the extent indulged in by their opponents, whose tastes often ran to a gaudy or multi-hued overall colouring. British pilots were generally content with a distinguishing numeral, a plain geometrical device such as triangle or one or more lines in parallel, or even a distinctive colouring of propeller-boss or landing wheels. In March 1918 all existing British squadron markings were officially abolished and their further use, in any form, was prohibited to all but scout squadrons in which some system of identification became of vital importance when large formations were engaged in air combat. The scout squadrons then in France were, therefore, allocated a new series of squadron markings. To avoid unnecessary complication, each marking was used to identify two separate squadrons; care was taken to ensure that the two squadrons thus bracketed were equipped with different and easily distinguishable types of aircraft. The British nationality markings, however, remained unchanged throughout the war and, except for the rudder stripes, which were abandoned in 1932, still survive in the “targets” which distinguish all machines of the Royal Air Force today. The German national markings, on the other hand, did undergo a war-time change, and for much the same reason as that which had earlier necessitated the abandonment by the British of the Union Jack emblem. It was discovered that, seen from a distance, the curved arms of the Maltese Cross were apt to appear as merged into a circle, and so be mistaken for the Allied “target”. 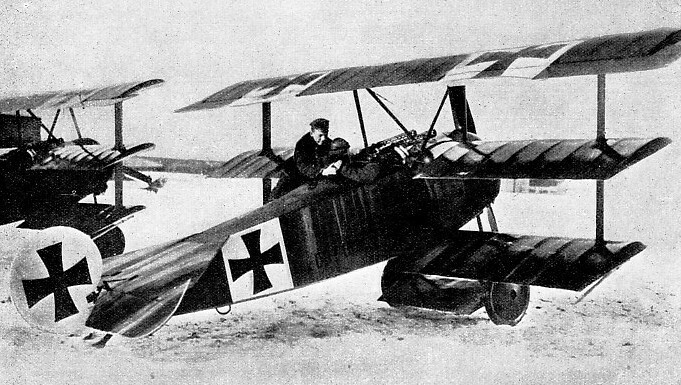 A plain black bar cross was therefore substituted for use by all German war aeroplanes produced after January 1, 1918. In the Royal Air Force after the war all markings other than the concentric circles of nationality were abandoned until about 1923, when squadron markings were once more introduced, but restricted to fighter units only. Larger and more decorative than those of the war years, these new fighter markings took the form of multicoloured strips, embodying geometrical designs of triangles and squares, painted along the sides of the fuselage and across the top plane between the national “target” markings. Bombers, flying boats and other Service types of aircraft had often to be content with a single distinguishing numeral painted on either side of their fuselages. with all the undersides in black. No distinctive markings are permitted to detract from the effectiveness of this protective colouring, and in the near future the only method of distinguishing squadrons will be by their unit badges. These, according to present regulations, may be reproduced on squadron aircraft on the white background of a distinctive emblem representing the squadron’s chief duty. Thus, fighter squadrons will carry their badge superimposed on a white arrowhead background; bomber squadrons will use a grenade background, and the Army cooperation squadrons will use a six-pointed star. On single-engined aircraft these unit badges are carried on either side of the fin. Multi-engined aircraft have them painted on either side of the fuselage, and flying boats, which may also carry badges, have them painted on the hull, beneath and slightly to the rear of the pilot’s cockpit. Finally, to make the transformation complete, a concentric ring of yellow has now been added to the red, white and blue circles to make them more easily distinguishable against a camouflaged background - the first alteration that has yet been made to the familiar “target” which has distinguished all British military aircraft since it replaced the Union Jack emblem in 1914. After the war, civil aviation, which had formerly existed only as experimental or sports flying, came into its own and there was a rapid and intensive development of the use of aircraft for the purpose of the public carriage of passengers, goods and mails. Once again, the necessity for some system of indicating the nationality of aircraft and of identifying individual machines, became a matter of urgent importance. This problem, with many other problems of international aviation, was considered by an international conference held in Paris in 1919. The result was the formulation of an Air Convention, which laid down a comprehensive series of rules for the international control of aviation, including the minimum standards for the licensing of aircraft and their personnel, and a uniform system for the registration and identification of civil aircraft. The Convention was signed by representatives of most of the principal nations of the world, notable exceptions being Germany, Russia, Spain and the United States of America. Spain later became a subscribing State to the Convention. The Convention came into force on July 11, 1922, and has since remained the charter and controlling authority of international civil aviation throughout the greater part of the world. For the purpose of identification, the Convention decrees that all aircraft engaged in international flying must bear nationality and individual registration marks. The nationality of an aircraft is that of the country in which it is registered, and is denoted by the first one or two letters in the group of five which, together, make up the distinguishing mark carried by each craft. Each nation has been allotted either one or two basic letters as its nationality mark and also a series of other letters, a combination of any three or four of which may be used as the registration mark for a particular aircraft. Each combination of letters following the nationality letter must be different as no two aircraft may bear the same registration markings. FOR EXPERIMENTAL PURPOSES certain aircraft are allowed to fly without registration marks, in what are officially known as “B” conditions. Approved manufacturers are authorized to fly unregistered machines, provided that each bears a distinguishing mark. The De Havilland Albatross illustrated has the number 9 painted on the fuselage for this reason. The letters G-AETW on the Empire flying boat in the air indicate that she is the Calpurnia. Thus G-ADHK on an aeroplane indicates that it is of British nationality, G being the basic letter or nationality mark allotted to Great Britain, and ADHK the registration letters of the machine, carried by it alone. Similarly, PH-AIZ seen on an aircraft would show that it was a Dutch machine, as PH is the nationality mark for the Netherlands, and AIZ would be the aircraft’s individual registration letters. The table above shows the nationality letter or letters of the various countries and shows also the range of letters from which they may select the various combinations of three or four letters needed for the registration and identification of individual aircraft. Although several countries may have the same basic or nationality letters, such as Barbados, Cyprus, Fiji, Grenada, St. Helena, St. Lucia, Mauritius, Palestine and Seychelles, all of which use the two letters VQ, the combination of three letters allotted to each invariably begins with different letters, thus making possible recognition of the aircraft’s country of origin. By international agreement these distinguishing marks must, on aeroplanes, be painted once on the lower surface of the lower main planes, and once on the upper surface of the top main planes, the top of the letters being towards the leading edge of the wings. They must also be reproduced along either side of the fuselage between the main planes and the tail planes. On airships, the marks have to be painted near the maximum stress section on both sides and on the upper surface. All free balloons must also carry registration markings; the marks must be painted twice near the maximum horizontal circumference of a spherical balloon, and near the maximum cross-section on both sides of a non-spherical balloon. All these marks have to be of such a colour in relation to their background as to be clearly legible at 250 yards’ distance in a clear atmosphere. Because of the different shapes and sizes of aircraft there is no fixed size for these markings, which must necessarily vary according to the space available. They must, however, conform to certain clearly defined standards. For example, the height of the letters on the main plane must be equal to four-fifths of the chord of the wing. Again, on the fuselage the height «of the letters has to be four-fifths of the greatest depth of the narrowest part of that portion of the fuselage on which the marks are painted. Again, so far as the constructional features of the aircraft permit, the width of the letters must be two-thirds of their height; their thickness has to be one-sixth of their height, and a space equal to half the width of the letters must be left between each letter. All the letters have to be painted in plain block capitals of uniform shape and size, and even the hyphen between the nationality and registration marks is subject to standardization and must be equal in length to the width of one of the letters. The uniformity of lettering which is so noticeable a feature of all civil aircraft, whatever their nationality, is, therefore, due to no lucky chance. The only licence permitted to the aircraft signpainter is that none of the letters need exceed 8 feet in height, a concession which is unlikely to console the owner of a light aeroplane obliged to disfigure the shapely lines of his small craft with no fewer than twenty giant letters of the alphabet. He is, however, two letters better off than his predecessor of a few years ago; for, until the relevant article of the Convention was redrafted in 1930, all aircraft were required, as well, to carry their nationality letter on either side of the rudder. THE NATIONALITY LETTER had to be carried on either side of the rudder of all aircraft until the Air Convention was redrafted in 1930. 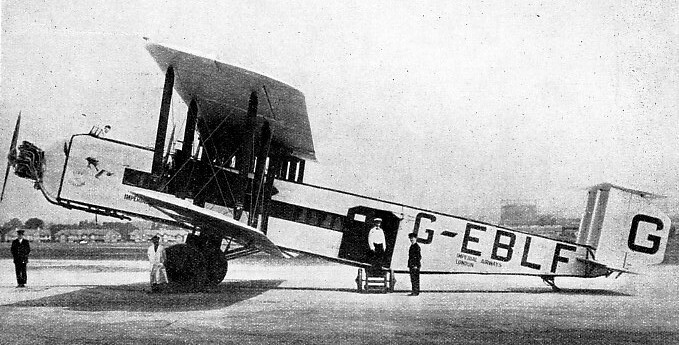 The City of Glasgow, an Imperial Airways liner plying on routes to the Continent, conformed to the earlier regulations. This three-engined biplane was one of the Armstrong Whitworth Argosy type. In addition to its external markings every civil aircraft is required to carry a metal plate inscribed with the name and address of the owner and with the nationality and registration marks of the aircraft itself. This plate has to be affixed in a prominent position inside the machine and, in air liners, is generally to be found on the inside of the main door to the passenger cabin. Once an aircraft has been registered and identification letters have been allotted to it, it is known officially only by those letters, however attractive may be the name conferred upon it by its owners. Moreover, international regulations require that use be made of these registration letters as a call sign when radio messages are sent or received. 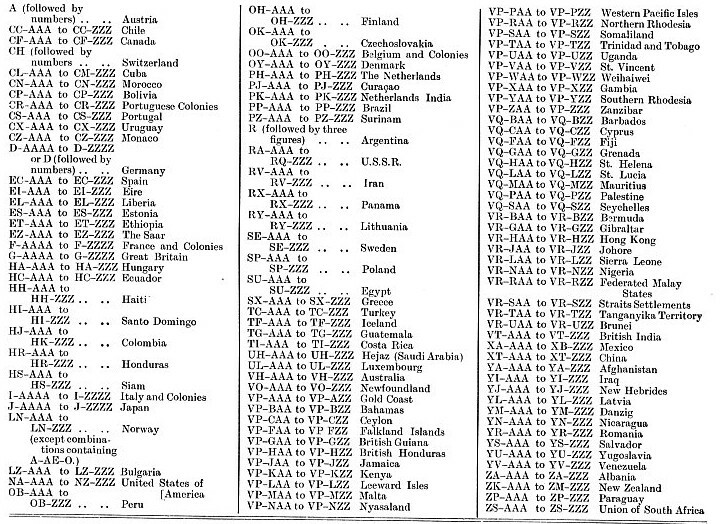 All nations subscribing to the Air Convention are asked to refrain from allocating as registration marks certain three-letter groups which, if they were to be used as radio call-signs, would be liable to confusion with existing radio code abbreviations. These forbidden letter groups are: all combinations beginning with the letter Q, because a code known as the “Q” Code is extensively used for radio communication between aircraft and ground stations; SOS and P.A.N. (international distress signals); T.T.T. ; X.X.X. ; A.B.Y., A.D.R., C.F.M., C.O.L., I.T.P, M.S.G., P.B.L., P.R.B., R.E.F., R.P.T., S.I.G., S.V.C., T.F.C., T.X.T. The international agreements embodied in the Air Convention are confirmed and made law in each contracting country by the passing of the necessary Acts of Parliament, or their equivalents. Each State also has its own regulations for the registration of aircraft and for the conditions in which an aircraft may be permitted to fly. Under the laws of Great Britain, aircraft may be registered in Great Britain and Northern Ireland, and so be entitled to carry British registration marks, only if they are wholly owned by British subjects or by a company registered in British territory and whose chairman, as well at least two-thirds of its directorate, are British subjects. Registration markings are chosen and allotted by the Air Ministry, and the certificate of registration, which costs £1 1s., lasts indefinitely so long as the machine remains in its original ownership. An aircraft may, however, have its certificate of registration suspended or cancelled at any time if the owner should be convicted of a customs offence or for any contravention of the rules governing air navigation. British regulations decree also that no civil aircraft, whether it is being used for private or for commercial purposes, may normally fly in Great Britain without registration markings. The only exceptions to this rule are when a permit has been obtained from the Secretary of State for Air, or when the machine is being flown in special conditions, known officially as the “A” and “B” conditions. The “A” conditions permit the flying of an aircraft without the necessary certificates of airworthiness or registration provided that the flight is a genuine test flight under authorized supervision for the purpose of the issue or renewal of a certificate of airworthiness. The “B” conditions relate to experimental flying in such a way that certain approved people, including most of the established aircraft constructors, are authorized to fly anywhere in the country machines which are unregistered, the only requirement being that the machines bear a distinguishing mark, allotted to each authorized person to show that the machines are being flown in these conditions. Advantage is frequently taken of the “B” conditions by aircraft firms when sending new and unregistered types of aircraft to take part in competitions or displays in various parts of the country. Such machines are easily recognizable as they have no nationality markings and generally carry instead some such device as P 6, or even a large single letter or numeral painted on either side of the fuselage. THE MALTESE CROSS was used by the early German military aeroplanes as an identification mark. This photograph shows Baron von Richthofen, the famous wartime pilot, in his Fokker triplane. The markings were placed on the upper and lower wing surfaces, on either side of the fuselage and on either side of the rudder. Click here to see the colour plate on “International Service Markings”, which appeared in Part 7, and click here to see the colour plate on “Fighter Squadron Markings” which appeared in Part 37. You can read more on “Aeroplanes of the Great War”, “Airships” and “RAF Squadron Badges” on this website.